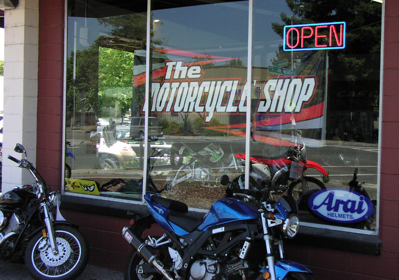 I’ve always found it odd that motorcycle shops are closed on Sundays. It’s got to be one of the busiest riding and tinkering days of the week. Yet almost universally, shops draw the curtains and don’t open them until Tuesday morning. I can understand closing Monday, but Sunday? It seems crazy, especially in these economic times. Open when you need it? “It’s just always been ride or race on Sunday and recover Monday,” said Brian Pecore, owner of The Motorcycle Shop, an independent service and accessories store in Santa Rosa. True, Sunday is traditionally racing day, but how many shops actually race? And if they do, wouldn’t it make sense to keep the till going and the money flowing in? It ain’t exactly cheap to go racing. Desperate for answers and certain I was probably missing some key point, I turned to several other shop owners who informed me that, no, I really wasn’t missing any key point. Aside from the fact that Saturday is an all-hands-on-deck work day and rest is needed, there’s no explaining the Sunday holiday. However, you can bet the reluctance to do business is welcome by at least one mega-retailer. Cycle Gear is open seven days a week. The Benicia-based chain with outlets in 26 states opened its 98th store in November. The 38-year-old company claims on its website that it is the nation’s largest and fastest growing retailer of motorcycle apparel and accessories. You gotta wonder how much they’re raking in on Sunday. “Cycle Gear always has, and always will put people first,” CEO Dave Bertram said.